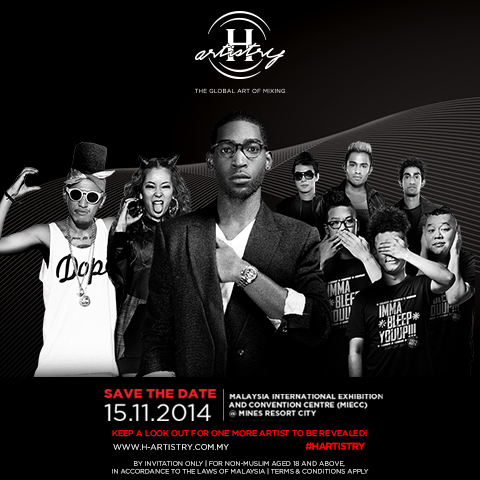 While H-Artistry always promises a night to remember, partying away to great music and good company. I can't help but feel a little bit disappointed with the line-up for the Finale, I was expecting a stronger line-up of DJs as Malaysia has really been low on a great venue for raves and such events. But it is in H-Artistry 's long tradition to always bring the best of the music world in all different genre to build and whatever it maybe it will still rock the night away! The awesome thing however, they managed to bring in CREAM from Japan, a Hip-hop J pop band that does a lot of awesome covers as well as their own songs. I really like their sound a lot and it's pretty refreshing to have a J Pop band to be coming in this time! I am pretty excited to watch them live! Also, My favourite trio will once again blow up the night with their awesome electro fist pumping beats. It's a sure thing that these guys will be firing the #erffquake machine and rocking MIECC! They are the boys from IMMA BLEEP YOUUP! IMBYU for short. I am also super thrilled to know that they will be collaborating with Paper Plane Pursuit for the live renditions of the latest singles, “Chasing Dreams” and “Live Forever”. The singles was an inspiration by the H-Artistry’s very own unique Global Art of Mixing platform that has connected these two artists from different genres and styles. I love Cream! They're one of my favorite Japanese duo's ever. Sounds like a really fun night you're going to have. Wish we had raves too. I have little bit know about it.I’ll likely be coming back to your blog.